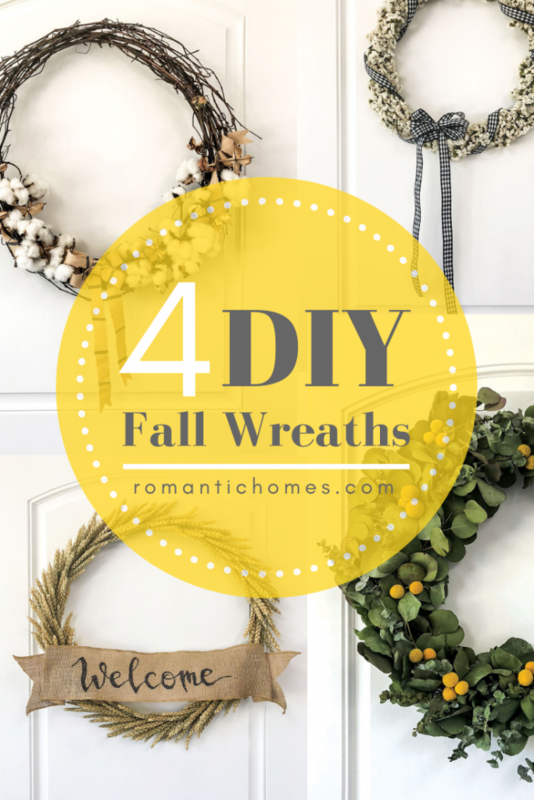 Transition your seasonal décor from summer to fall with these four easy DIY wreaths. Welcoming guests to enjoy your hospitality or greeting you as you arrive home again, your front door always makes a first impression. 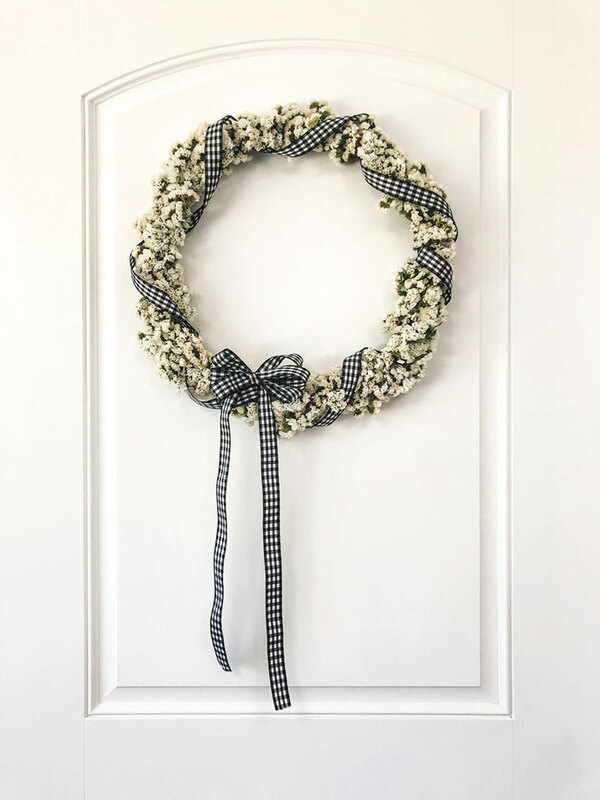 Of all the ways to create a friendly and well-styled entry for the season, a wreath is the one of the simplest options. 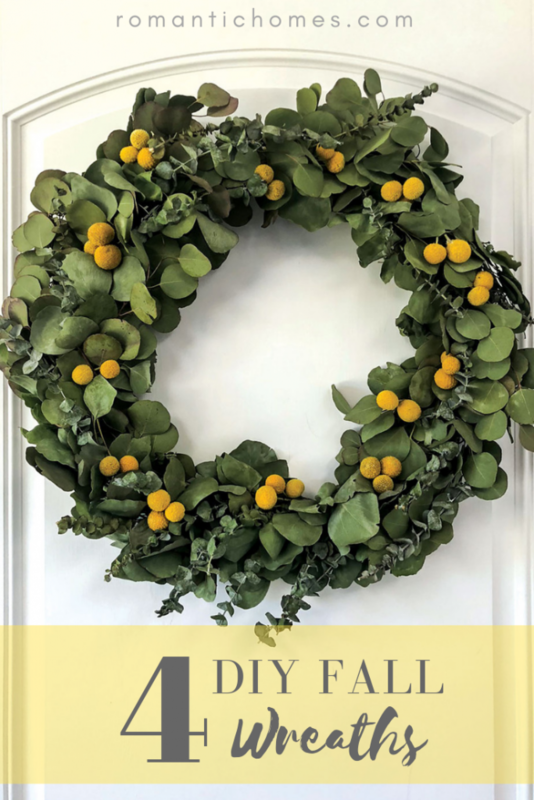 I collected and dried natural materials to craft these four DIY fall wreaths that beautifully bridge the seasons between summer and fall with farmhouse-inspired style. The key to arranging eucalyptus is in forming the greens around the frame while they are still supple and fresh. After letting the leaves dry for a few days, the dried craspedia balls were glued into position. 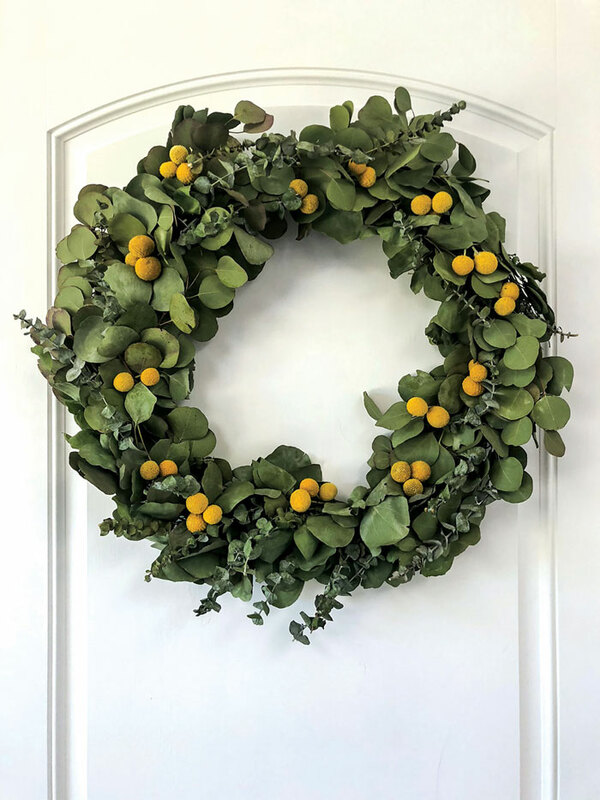 Yellow craspedia is a cheerful addition to this wreath, made of two types of eucalyptus. I started by drying the craspedia a week in advance by hanging it upside-down in bunches. Fresh from the flower market, the wide and round leaves of the Silver Dollar eucalyptus and the long, narrow stems of the Baby Blue variety were woven into the wire wreath frame. These were allowed to dry on the wreath frame and will retain their shape and color over time. However, you’ll have to enjoy the fresh scent of eucalyptus while it lasts, as it diminishes after drying. When the wheat almost completes the circle and the overlap becomes difficult to maneuver, wrap up the floral tape and switch to hot glue to fill in any gaps. 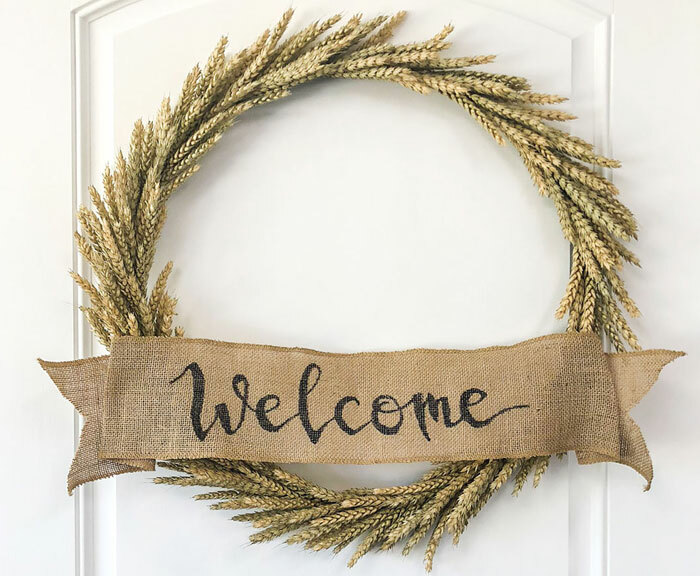 As summer turns to the season of harvest, greet it with a wreath of dried wheat! These golden stalks are wrapped with floral tape around a thin wire frame in bunches of three for a sleek silhouette. 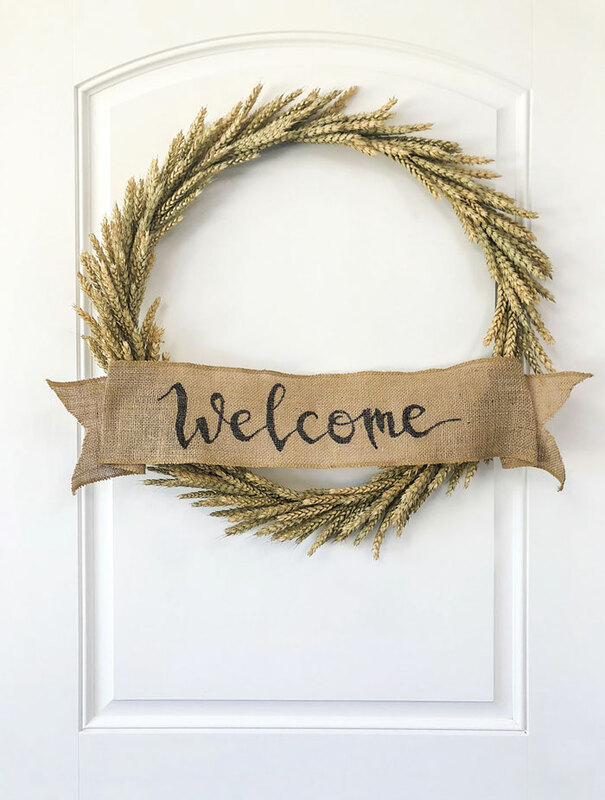 A hand-lettered “Welcome” is the final touch across the burlap banner that can be customized with any message. I recommend assembling this wreath with a vacuum cleaner nearby, as the dried wheat tends to shed quite a bit during the wrapping process. Let the statice completely dry on the wreath form to avoid brittle stems. 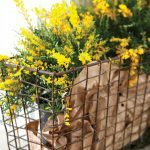 A hearty flower that retains its shape and color from fresh plant to dried cutting, statice is both relatively inexpensive and forgiving to work with. Using floral tape and a small wreath frame, add each bunch of statice while keeping the flower heads close to the wreath frame. Once the circle is complete, wrap a gingham ribbon around it and finish with a sweet bow. The brown star shapes are the same pods but without the fluffy cotton. Intersperse these throughout the arrangement for variety. Nothing says “farmhouse” quite like the cotton stem. The dried plant is elegant, earthy and easy to work with. I started this wreath by pulling a pre-made grapevine wreath in half for a less bulky look and securing the new, thinner form with wire. 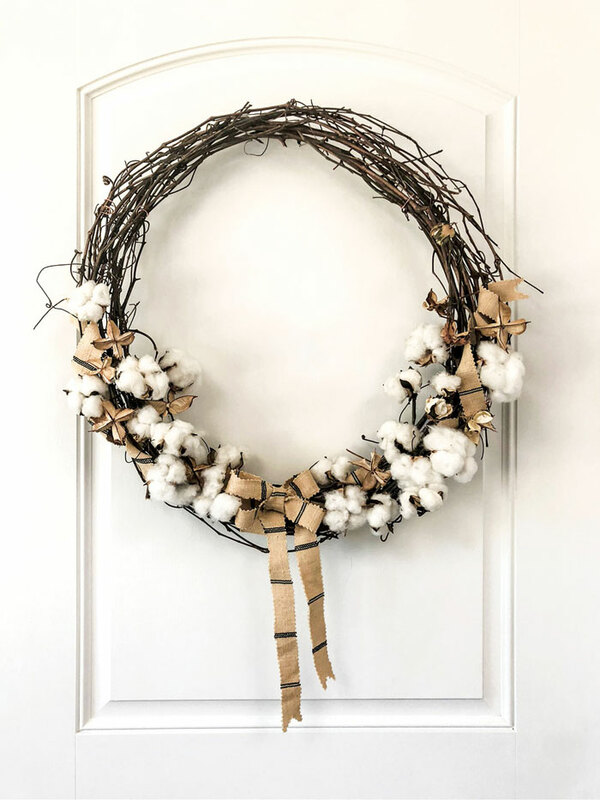 Next, striped linen cut into ribbons with pinking shears was wound through the vines, and cotton pods were placed over the lower half of the wreath. The history—and reality—behind this white-hot kitchen collectible. Thanks to Bessie Littleton, Pyrex is now a common kitchen staple. Decades ago, however, the product revolutionized kitchens across America. 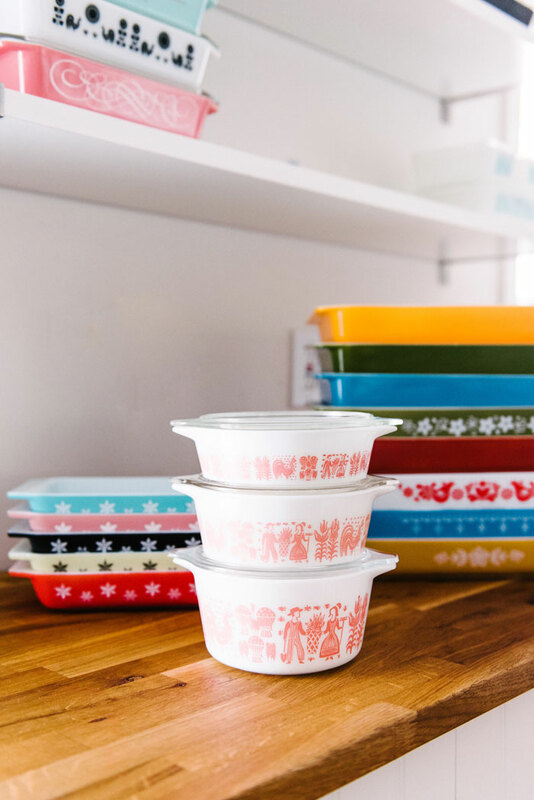 Able to withstand high temperatures, colorfully produced and sentimentally linked to sweet memories of baking with Grandma, vintage Pyrex is experiencing a popular renaissance, and for good reason. Though the brand has been taken for granted as a kitchen mainstay for more than a century–with pieces regularly handed down from one generation of home cooks to the next–Pyrex glassware was once a revolutionary innovation. Promotional pieces like this “Blue Chip Week” pyrex dish are more rare than other mass-market patterns and therefore tend to be valuable to serious collectors. Over 100 years ago, a resourceful housewife named Bessie Littleton requested and received a wet-cell battery jar made with a new type of glass that her husband, Jesse, had introduced her to. He was a research physicist at Corning Glass Works at the time, and the company was testing and producing temperature-resistant glass for industrial applications. Legend has it that yet another of Bessie’s baking dishes had cracked, and she was inspired by Jesse’s work to find out if the same material Corning developed for railroad lanterns and battery jars would be useful for baking and cooking. Jesse cut the height of the jar down, and Bessie successfully baked a cake in it. The couple’s domestic discovery led to further research at Corning, and in 1915 the company launched a line of kitchenware under the brand name Pyrex. In the following decades, a series of advancements in manufacturing made Pyrex cheaper and easier to produce, while World War I, the Great Depression and World War II drove patriotic and budget-conscious homemakers to the American-made, affordable kitchenware. These pieces were produced in clear glass up until 1936, when opaque white “opal ware” was introduced. Opal ware is the blank slate over which the bold colors or playful patterns were later added that we know, love and collect today. 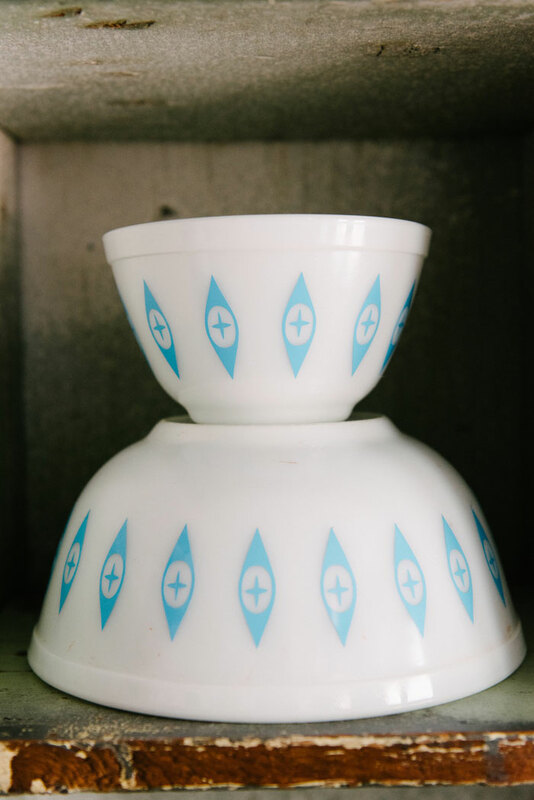 Sturdy, practical and pretty, vintage Pyrex has survived from one generation of home cooks to the next. Nostalgia adds to to it’s charm. 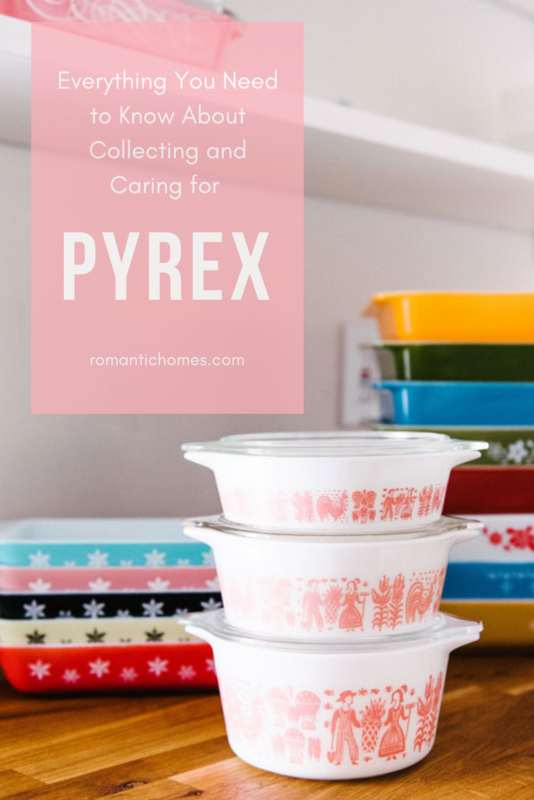 Jessica Freitas, an avid collector of Pyrex, who shares some of her vast collection on these pages, fondly remembers the pieces her mother used and how she came to appreciate them herself. “At a young age, I honestly didn’t think much about Pyrex. Back then I was more concerned about not having to wash dishes! Truth be told, I’m still not excited about washing dishes, but I love collecting them,” she laughs. Similarly, aficionado Jennifer Elizarrez recalls that her collecting journey started with one particularly arresting piece. “I found a pink Gooseberry mixing bowl in a thrift store, and I thought it was so pretty. Of course, I started searching for the other pieces on eBay and realized that they were quite desirable and expensive,” she says. 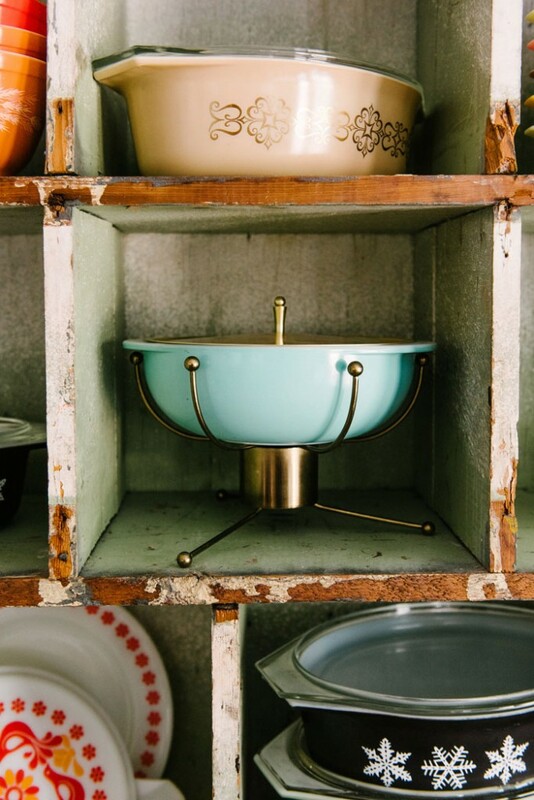 “At that point, it became fun to start searching for Pyrex at thrift stores, estate sales and flea markets.” Jennie’s favorite pieces are her Hot Air Balloon chip-and-dip set, and Starburst and pink Stems casserole dishes. Pyrex stands and their companion dishes are particularly desirable, as complete sets often lose pieces over time. Purchasing an unusual dish, however, could cost a small fortune. “Most collectors like myself have invested in rare and one-of-a-kind pieces,” says Jessica. 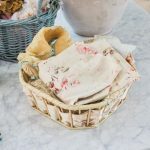 “A with most hobbies, collectors who want the best have to pay for the best!” Highly prized in her collection are Butter Print mugs and a Dianthus-pattern bowl. 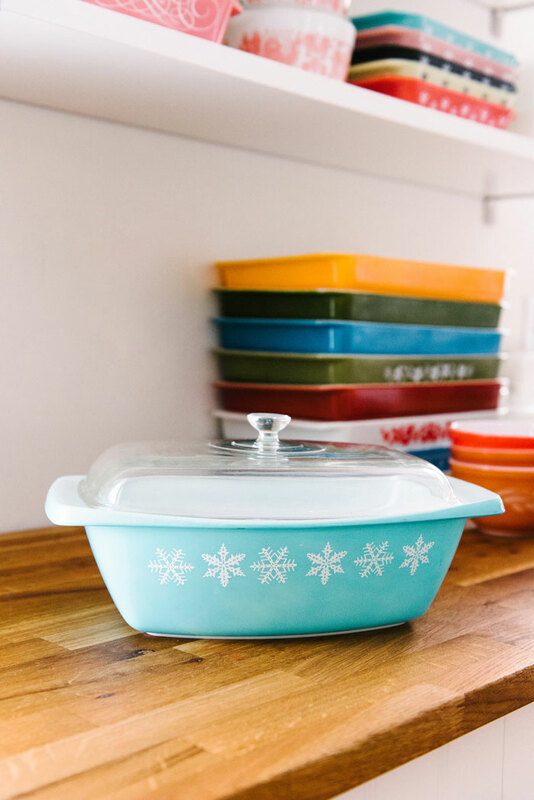 The turquoise snowflake pattern is among the first screen-printed patterns that Corning produced for the Pyrex line. When official pattern names fall form memory or don’t quite catch on, collectors will step in with ready substitutes. This pattern is now known as “Atomic Eyes” for it’s Midcentury Modern aesthetic. These two bowls would have originally been part of a chip and dip stand set. An aspiring collector would be wise to invest time in research before investing money in Pyrex. Different marketplaces, and different vendors within those marketplaces, command different prices. Likewise, Pyrex patterns, and color variations within those patterns, command different prices. This often confusing and arbitrary system can make it difficult for a novice to fix a reasonable value on eBay listings described as “ultra rare” or “very hard-to-find,” because sellers often use these terms to attract attention to items that are really quite common. Jessica advises that research helps to cut through misinformation. “First and most importantly, don’t believe everything you read.” In agreement, Jennie says, “Pyrex, like most things, is only worth what someone is willing to pay.” Complete sets in excellent condition and printed in popular shades–such as pink and turquoise–are among those desirable patterns currently dominating consumer attention. Butterprint, or “Amish Butterprint” dishes in pink. This pattern is more commonly seen in turquoise, and was also produced in orange. 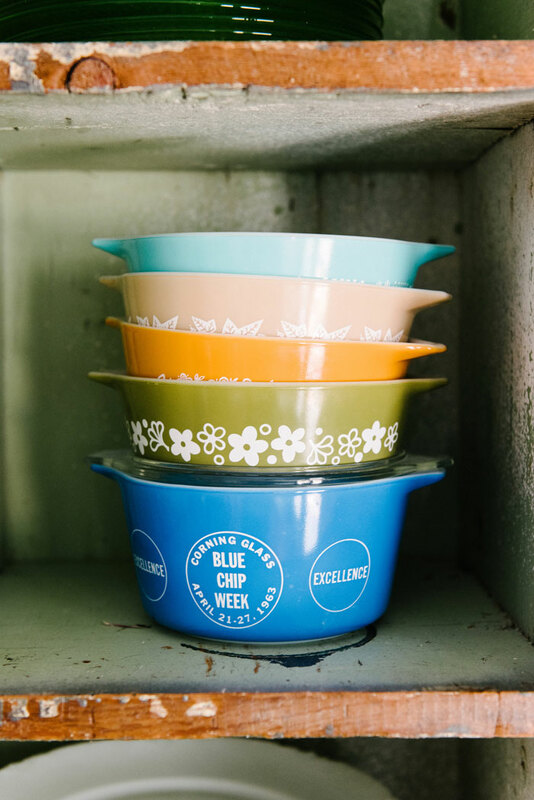 Over 150 designs have been documented–such as the ever-popular turquoise Butter Print– by passionate Pyrex collectors who are thrilled with the hunt for that last mixing bowl to complete a set or that certain casserole dish they’ve always coveted. But what really keeps enthusiastic collectors on their toes is the potential to uncover a rare piece–like the famously elusive Lucky in Love pattern–or even better, something mysterious that no one else has recognized. 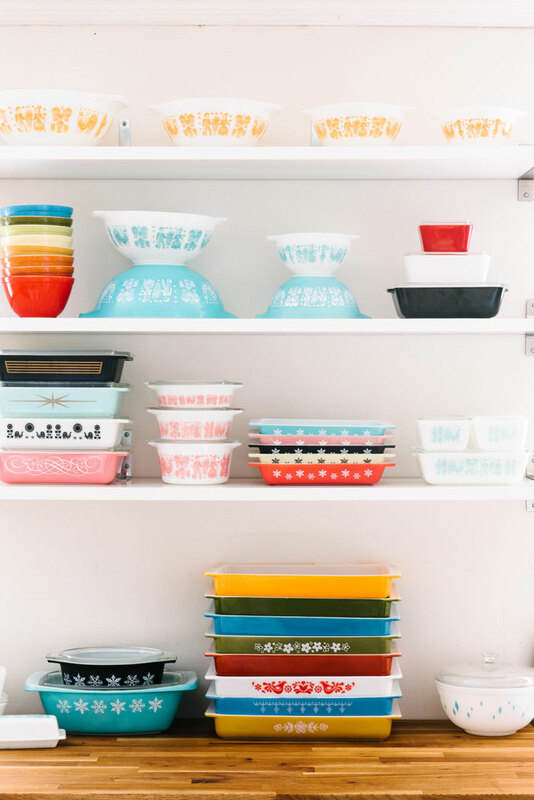 With options available at every price and in so many different shapes, sizes and colors, anybody–serious collectors and casual kitchenalia admirers alike–can find a vintage Pyrex piece to suit their personality. Perhaps your next trip to the local flea market will reveal another Gooseberry bowl or a complete set of Friendship. 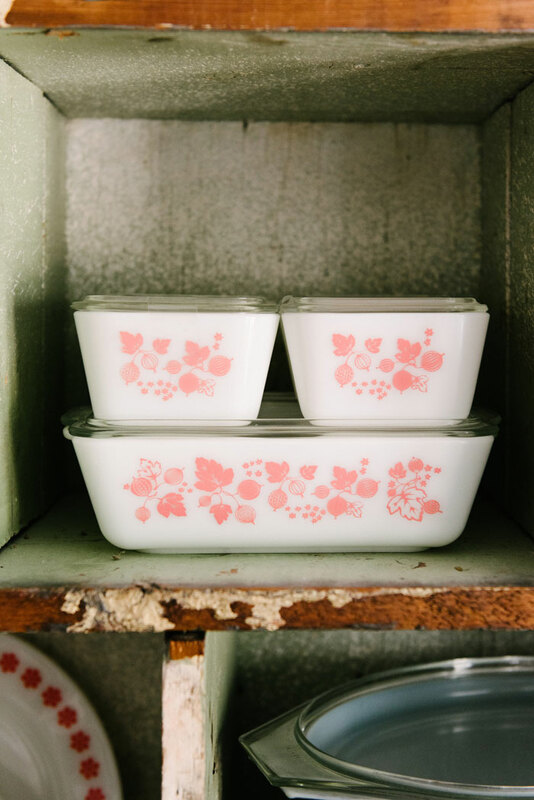 Gooseberry in pink, with mixing bowls, refrigerator storage containers (pictured) and casserole dishes, is currently one of the most popular patterns available. $: Thrift stores, garage sales and estate sales tend to have the lowest prices, but the trade-off is many of these pieces have been purged because they are in less than stellar condition. Be prepared to wade through faded, marked or otherwise damaged goods before finding a fantastic specimen. 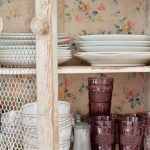 $$: Flea markets and antiques malls frequently host vendors who curate the Pyrex they sell, weeding out pieces with the aforementioned imperfections. Vendors who put effort into culling and cleaning their merchandise can be expected also to have made the effort to research their wares for appropriate market value. Tip: These vendors may also expect customers to negotiate price, so feel free to politely proceed. $$$: Etsy, eBay and other vintage vending sites typically hold the rarest pieces because the infinite Internet audience opens the potential for higher prices or bidding wars. However, there are also endless options at reasonable prices. Tip: Ask for additional photos if you don’t feel satisfied by those provided in the listing. Top, center: Turquoise Butterprint mugs. Middle, center: Refrigerator storage dishes in red and yellow, with the Friendship pattern below. Bottom, center: Hot Air Balloons pattern Cinderella bowls. Jennie and Jessica agree emphatically that the dishwasher should be avoided at all costs! 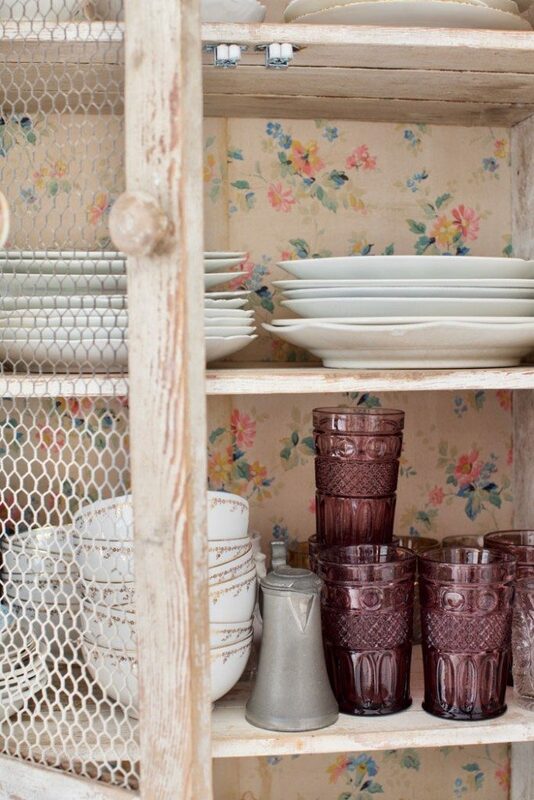 “Vintage Pyrex was never made to go into a dishwasher,” says Jennie. “A good rule of thumb is if the piece was made before the dishwasher was invented, never put it inside a dishwasher.” This otherwise timesaving modern convenience can cause the shiny finish and printed designs to wear away. Instead, she recommends soaking in a sink full of hot, soapy water and cleaning with a soft sponge. Jessica adds that she has successfully used Peek to remove those ugly gray utensil marks. 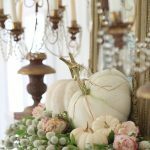 With a large collection, decorators can group similar colors and patterns together in themed vignettes to coordinate with the seasons and holidays. Just as there is a pattern to appeal to every person, there is a pattern for every season. 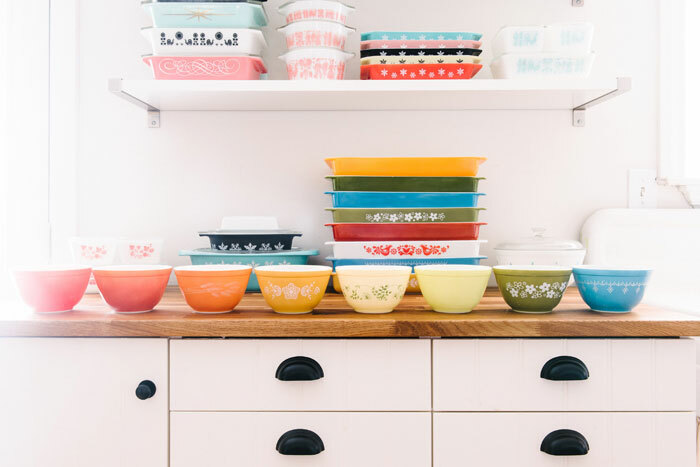 Jennie says, “I love constantly switching up my Pyrex displays for the holidays and seasons, although my favorite colors to collect are pink and turquoise–which of course are the hardest to find and the most valuable.” Her collection, however, is a veritable rainbow. “I do collect all colors because I love creating Christmas, Thanksgiving, Easter, Valentine’s Day and even Fourth of July displays,” she says. 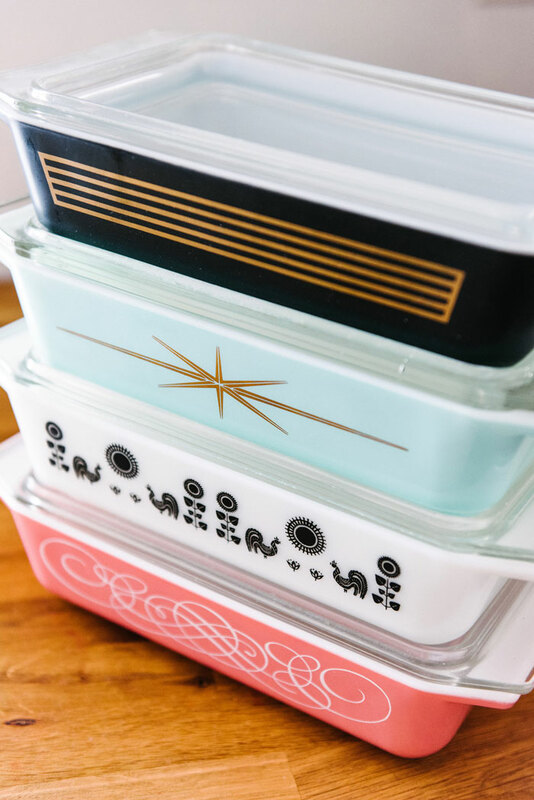 “My pink and turquoise Pyrex pieces stay up year-round when the holiday displays are not up.” You can see her retro interior style on Instagram at @jennie_loves. Pyrex is often confused with pieces produced by Anchor Hocking, the company behind Fire-King and Jade-ite, which is arguably equal in popularity to Pyrex. Adding to the confusion is the fact that both brands produced products that were aesthetically very similar. Check the bottom of pieces for logos to clear issues of attribution, or try a quick Internet search. 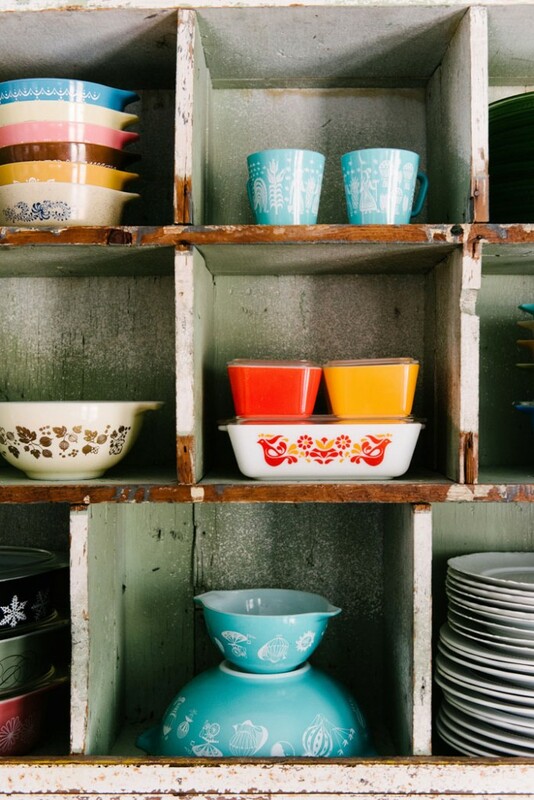 The vintage Pyrex pieces that are most familiar to us today were, and still are, made in America. But did you know Pyrex was also produced in Canada, England and Australia? These countries produced original designs that are just as collectable as those produced in the states. Look for stamps or labels with “Made in…” markings that show the nation of origin. Brand names like JAJ (England) and Agee (Australia) also reveal origin. 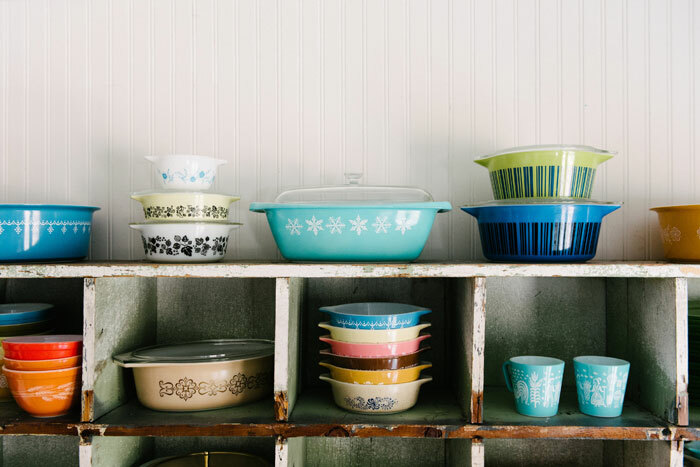 Thanks to Jennifer Reed for sharing her Pyrex collection with us. 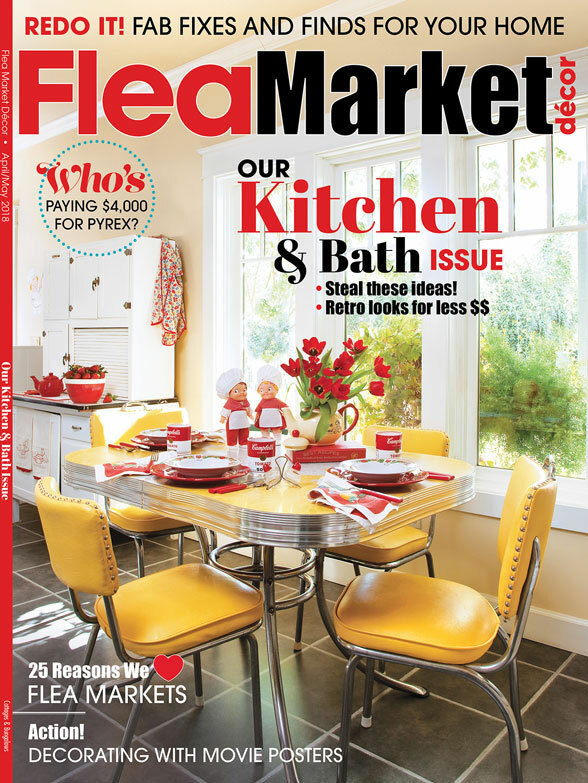 This story originally appeared in the April/May issue of Flea Market Decor. 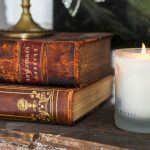 You can subscribe here to enjoy more stories on your favorite collectibles and tips for decorating with an eclectic touch. You can also follow on Instagram for more vintage inspiration. It’s easy to impress your guests with a bountiful cheese board. 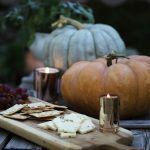 Keep small plates and multiple cheese knives available for guests to easily serve themselves. 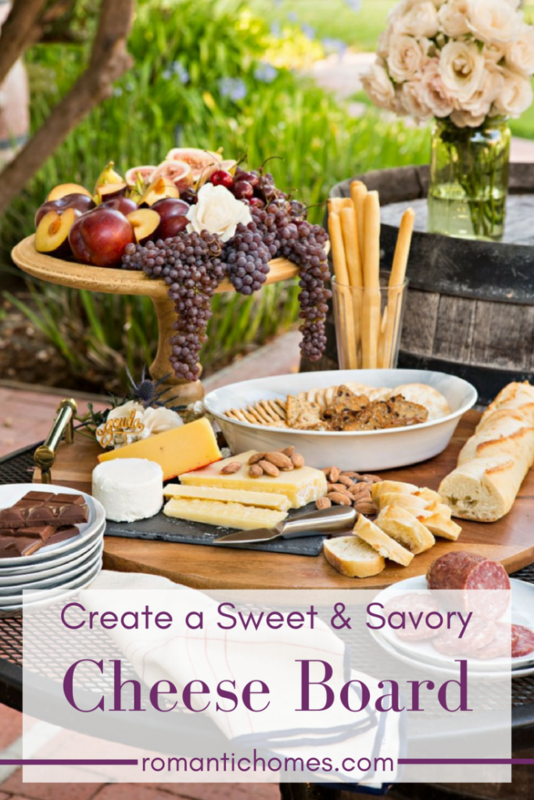 Whether you’re merely planning to set out a satiating snack for an informal event, or you’re arranging the appetizer before a larger course, you can’t go wrong with a well-considered cheese board. These spreads are easy to prepare and allow guests the opportunity to customize their own combination of flavors. Sweet or savory? Indulgent or simple? Everybody wins. 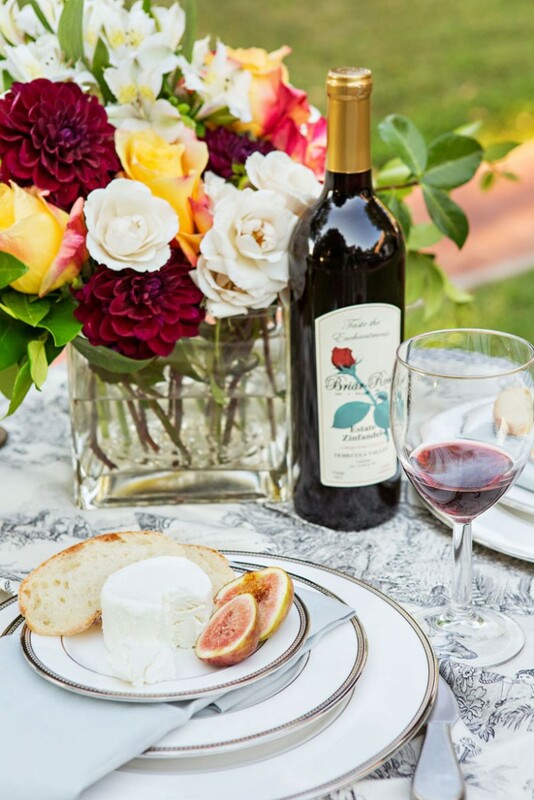 Pair your selected cheeses with other delicacies like figs or Champagne grapes, and complete the scene with a bouquet of elegant and bold flowers. Our board starts with the rule of threes and places an emphasis on coordinated variety. The three cheeses each have a different texture and a unique flavor profile: the spreadable and tangy goat cheese, the sharp and brittle aged cheddar, and the mild and creamy gouda. To pair with our cheeses, we’ve selected a soft baguette, plain water crackers and a crunchy multi-grain crisp. Layer flavors for taste and linens for elegance. Remember too, that food almost always tastes better enjoyed in pleasant weather. 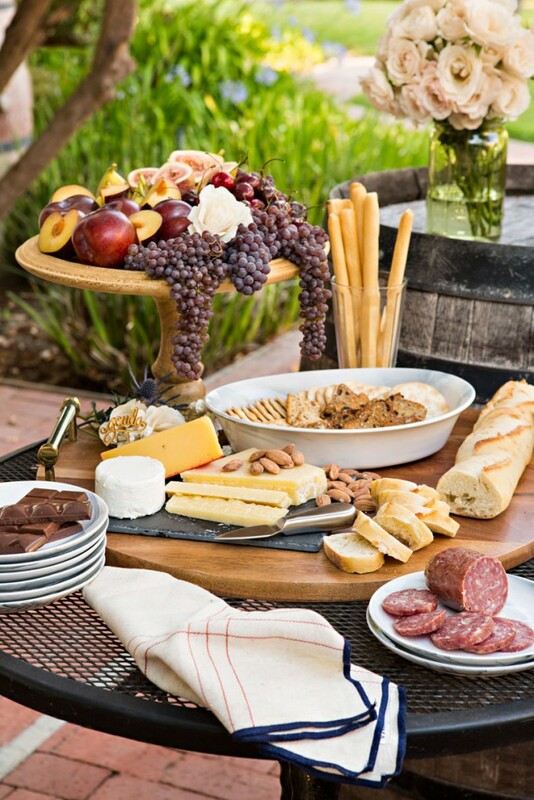 No cheese board is complete without charcuterie meats that bring a substantial and savory flavor to the layout. Balancing the above items are Champagne grapes, figs and plums to provide a healthy dose of sweetness. Salted almonds are another healthy addition, and for a more indulgent touch, we simply had to add dark chocolate. Treat your guests’—and your own—taste buds to the perfect combination of flavors. 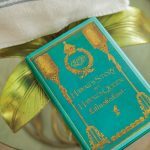 The editors of Romantic Homes share the antiques and decorative objects that speak to their hearts. I once wandered into an old antiques store sale with a sign on the front door that read, “Enter at Your Own Risk.” I laughed, but once inside, I could see it was a sale where you might have wanted a pair of gloves and a mask. In the basement of the store, there were stacks and stacks of frames leaning against each other. I spotted one that felt heavier than the rest. Wiping away the years of dirt and dust off a small corner off the “glass,” I was delighted to find it was an old mirror. I hauled it upstairs and purchased it for the major bargain price of $3, not even knowing what it looked like underneath the layers of grunge. 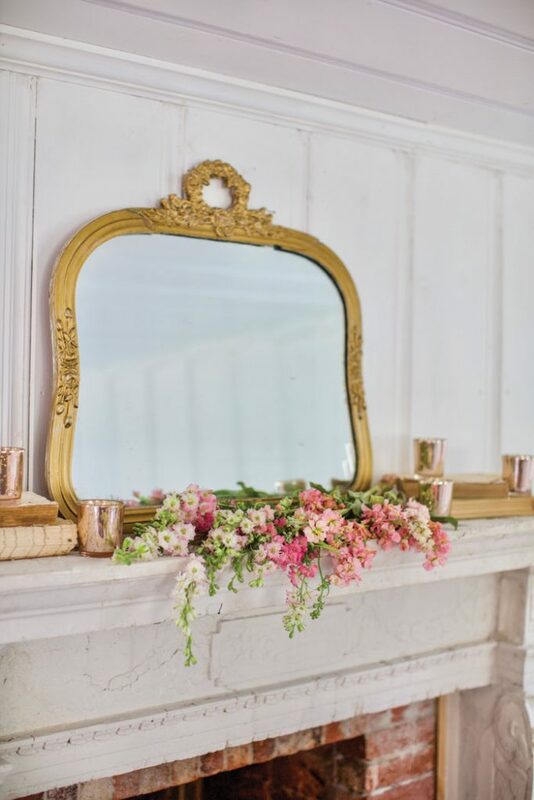 Once home, after cleaning it up, I found a charming pale-green paint covering the carved frame and the loveliest mottled finish in the glass. It is now a favorite mirror and one whose story it’s always fun to tell. 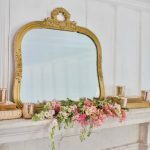 I have a thing for mirrors—all shapes and sizes—and have been known to drag home the tiniest of mirrors for setting on a shelf. The largest of mirrors may require a truck and a few strong folks to help load. My favorite things to look for are that mottled-looking glass, old gilding and chippy patina on the carvings on the frames. 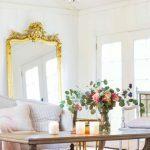 The best thing about mirrors is that they send sunshine and light through your room, and you can enjoy them as they are and appreciate their frames and character, even if they don’t reflect as well as they used to. They are easy to tuck into a corner, lean against a wall or serve as a statement piece almost anywhere. My favorite collectibles are baskets. They have a very long history, dating back to at least 7000–8000 BCE. They appear in every country and culture, not to mention folklore and literature. From Moses’ basket bed in the bulrushes to the basket Little Red Riding Hood carried for her grandmother to the brown-and-yellow basket of the jazz standard “A Tisket, a Tasket,” baskets are functional and beautiful. And their uses are without limit. Whether made of reeds, rattan, cane, wood, wicker, wire, sheet metal or baleen, baskets help us store, gather, organize and transport everything from fabric remnants to papers to jewelry to coffee beans to a picnic lunch. I love using old baskets in my home as décor. They might be antique, French, early American, African, Brazilian or made by indigenous people from Alaska or anywhere. They come in all sorts of sizes and colors, with handles or not, and with or without lids. I have used baskets to hold rings, mail, receipts, bread, faux flowers, important papers, fruit, laundry, and many other items. 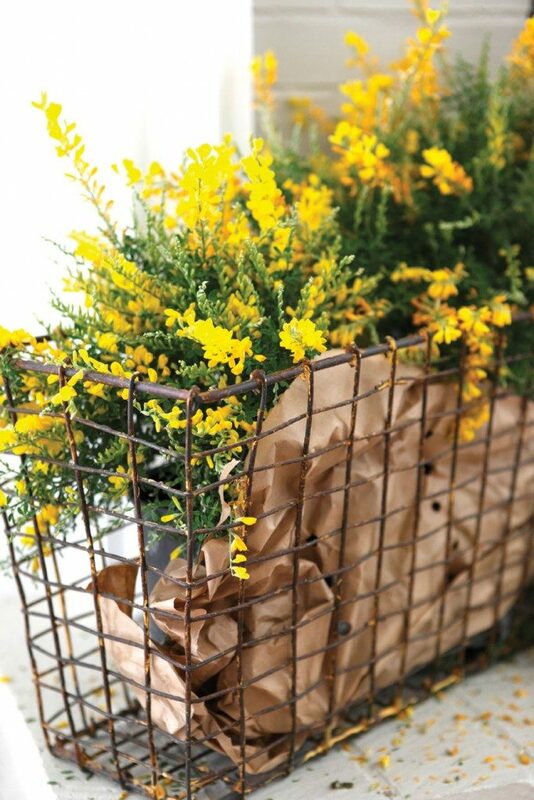 A large, handsome basket prominently displayed can be a statement piece in a room. 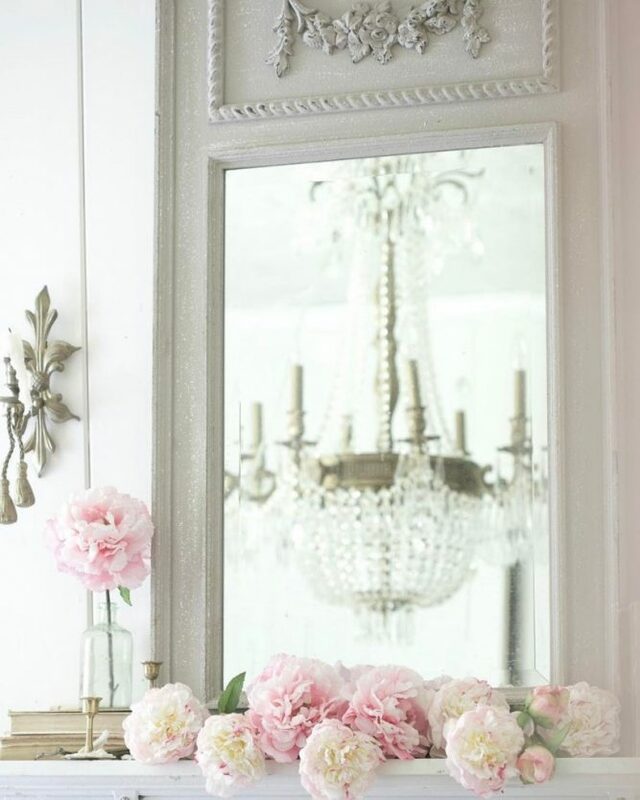 I especially like to show them off as beautiful objects, on their own or as part of a vignette. 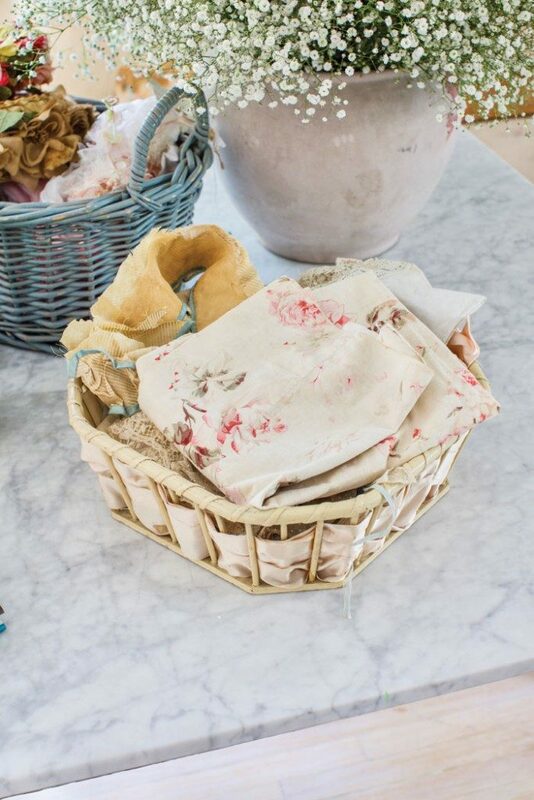 I’ve found lovely baskets at flea markets, antiques shops, friends’ attics, garage sales—almost anywhere. Just be sure to take your shopping basket, and happy hunting! I don’t know what it is exactly that draws me to vintage scales. Maybe it’s because there’s a certain nostalgia behind the trustworthy tools of yesteryear that makes them relics. Even with chips and rust stains, these timeworn items can decorate your home like pieces of sculpture. 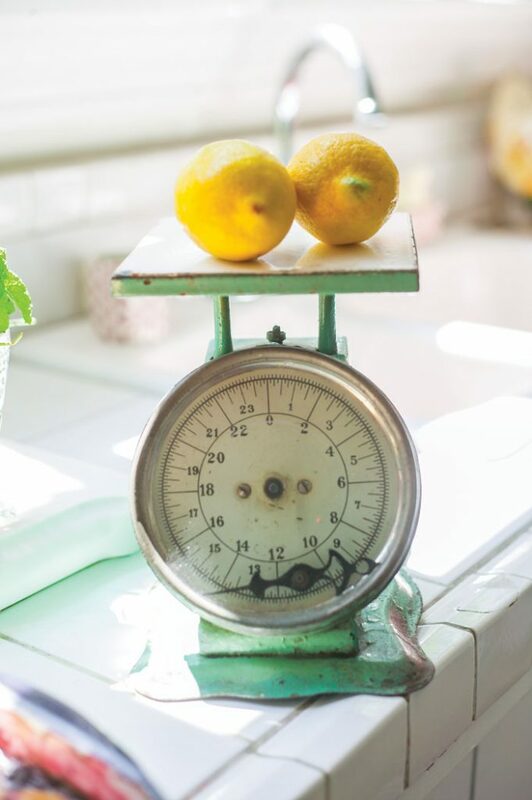 Modern versions pale in comparison to the charm of vintage kitchen scales. 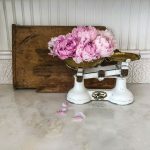 While you can find kitchen scales from the turn of the 20th century, you don’t necessarily have to buy an authentic antique; believable reproductions are readily available as well. 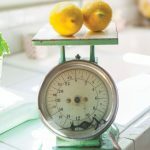 Whether the look you’re creating is industrial, retro, girly-romantic or cute and country, there are many different styles of kitchen scales to choose from. 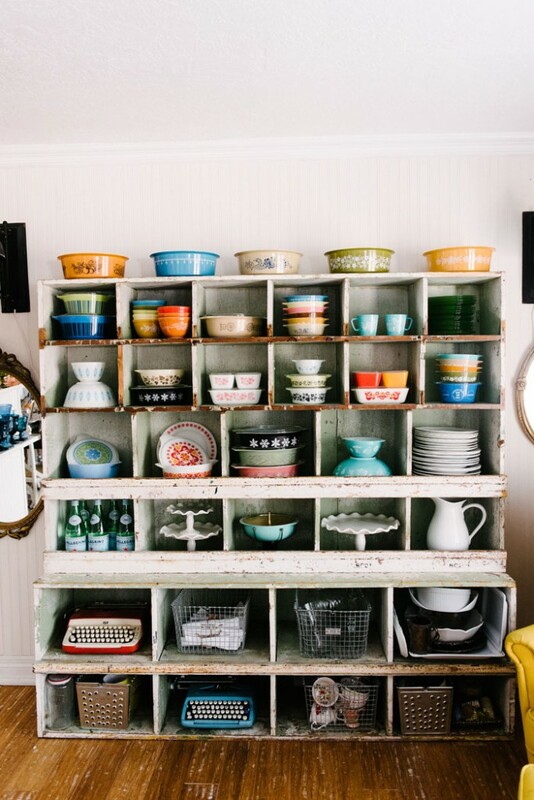 Your best bets for sourcing one could be your local antiques store, an online Etsy shop or a flea market. 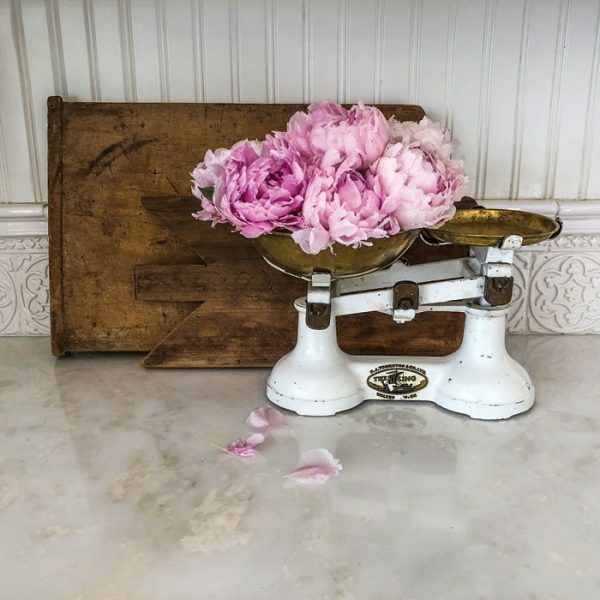 Proudly display your vintage scale on a shelf, decorated with fresh flowers, in an antique cupboard or on your countertop for all to see and admire. I am more than willing to judge a book by its cover–and also by its spine, interior illustrations and that comforting fragrance wafting from old pages. Out of my assorted collections, I continually find myself investing time, energy and appreciation in my old books. I hunt for them at Friends of the Library sales or antiques shops, I arrange and rearrange them in vignettes throughout my house and, of course, I read them. Usually with a large mug of English breakfast tea. When I was growing up, my parents’ house was filled by the volumes handed down from generations of avid readers. When I first picked up Pride and Prejudice or Huckleberry Finn, I was reading a vintage edition with the names of my ancestors inscribed on the front pages. 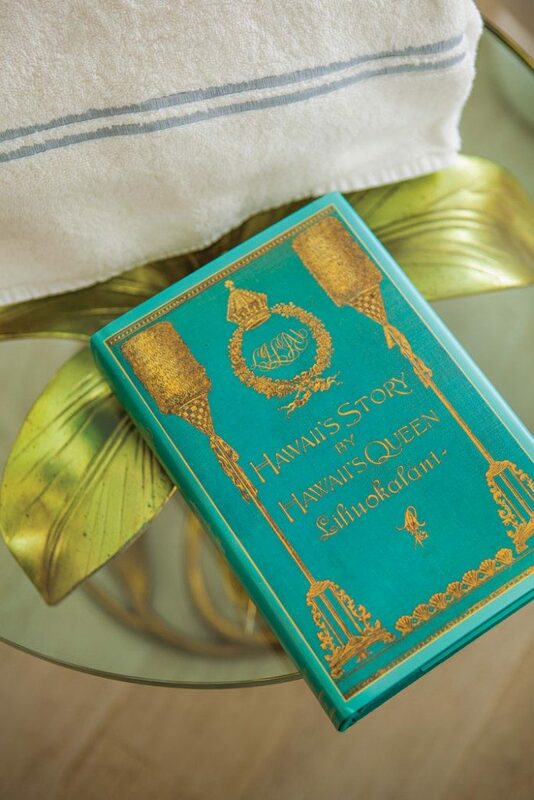 Some of these family heirlooms moved with me to my own home, but most of my books are strays–picked up here and there for a few dollars–with an occasional splurge when I see a gorgeously gilded cover with fancy lettering. I collect white luncheon plates. You know, it’s the mini plate with a place for a cup on one side. These luncheon plates used to be a staple at bridge parties in the 1940s. My obsession began when I found one at a thrift store for $1.00, and then it became a giant treasure hunt for me. I’d scour estate sales, yard sales and junk shops—all in the hope of finding another elusive luncheon plate. The only rule I had was that I couldn’t pay over $1.00. The collection that started with one plate and one cup is now rounding on 75 sets. The plates are stacked four or five high on the shelves in my butler’s pantry. This is also a collection that we use on a regular basis. I pull them out for every party, graduation, shower and celebration. They’re so much more affordable than paper plates and paper cups. And the best part? When the party is over and the guests leave, I rinse them off, dry them and put them back on the shelf until it’s time to party again. 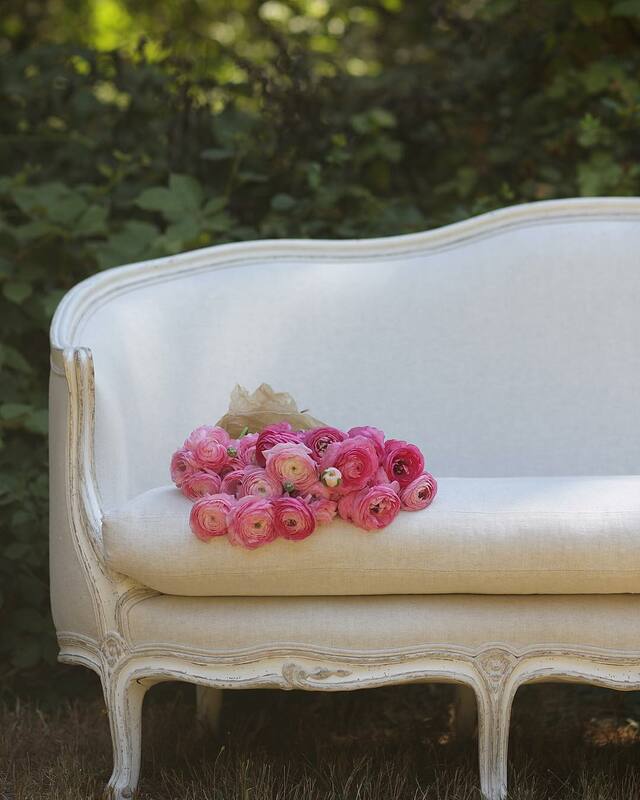 Looking to import the timeless elegance of French décor? Courtney shares her personal recipe for creating a comfortable cottage. 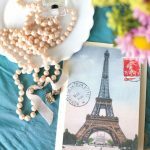 With the French-themed February issue now on newsstands, we’re inspired by the petite cottages and grand chateaux featured in these glossy pages to discover more about importing the je ne sais quoi of French style into our own homes. And who better to turn to for inspiration and advice than our own brand leader and editor, Courtney Allison? 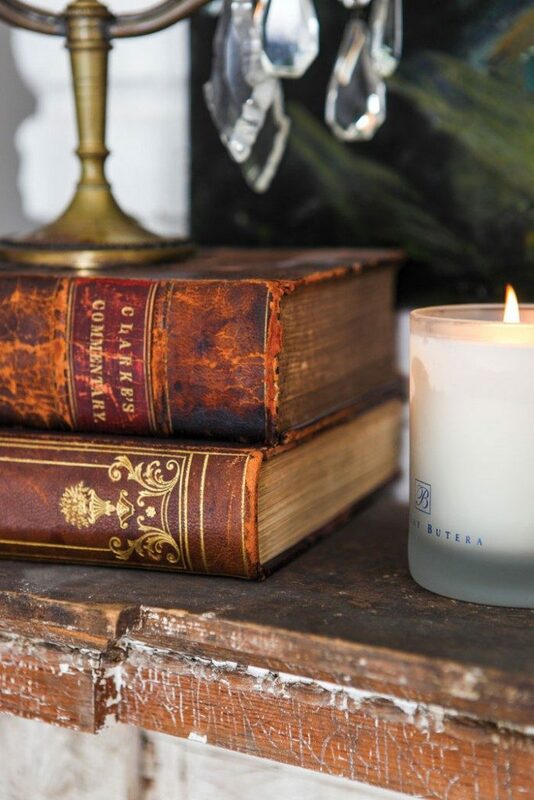 Her signature interior style blends the timeless elegance of French décor with the fresh comforts of the cottage lifestyle, where simple pleasures are meaningfully embraced. 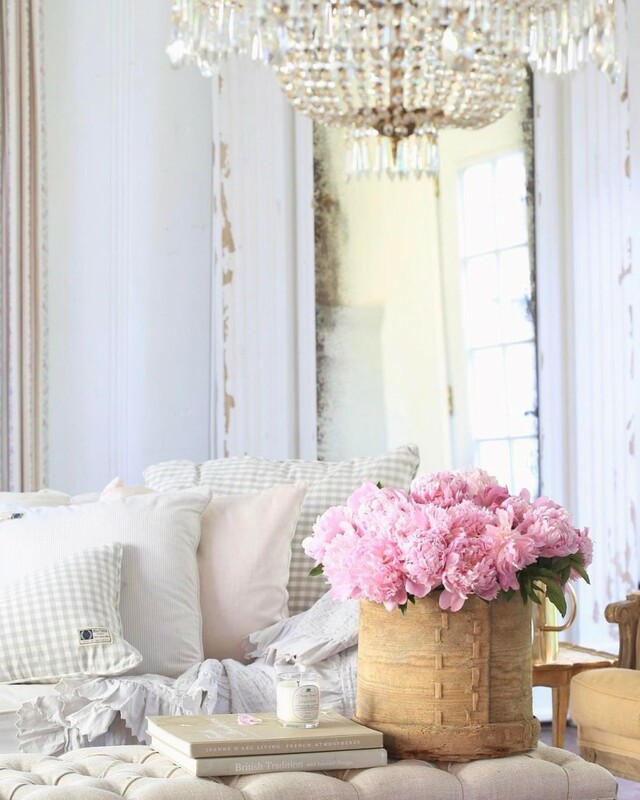 Read on to get Courtney’s personal recipe for getting the French Country Cottage look! Courtney’s style is inspired by the rich details of fine vintage craftsmanship paired against the obvious touch of time, like in this carved table with a chipped paint patina. What is so timelessly fascinating about French decor? Glittering chandeliers add a glamorous touch to any-and every-room. 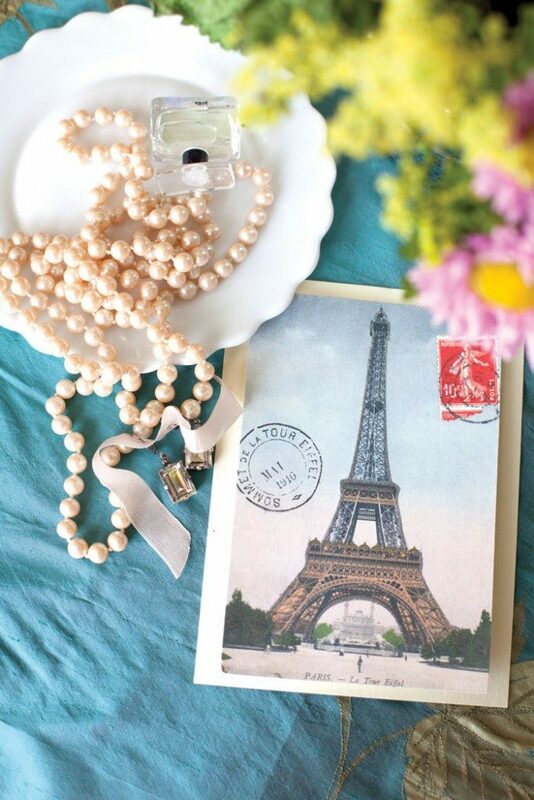 What are your must-haves for the French Country look? Throw pillows are an easy and affordable update to any space. Mixing and matching patterns also adds an element of interest. How do you customize the look to suite your own taste? 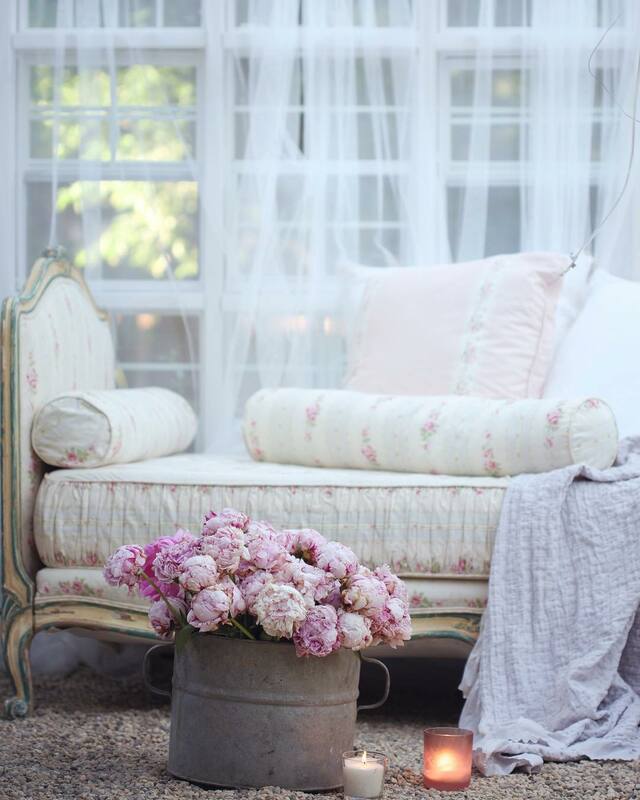 Vintage floral upholstery and teal trim add whimsical elegance to Courtney’s greenhouse. What practical encouragement can you give to someone who wants to decorate in this style? The February issue is currently on newsstands and available online! 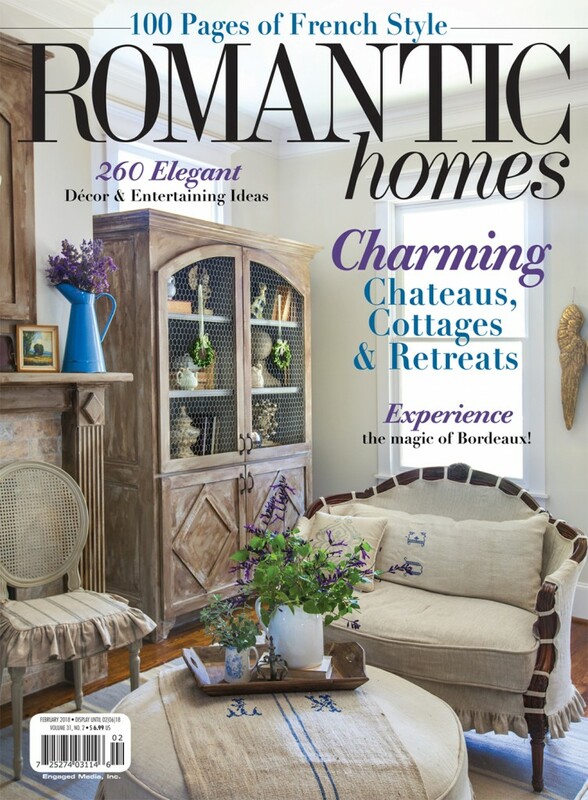 Pick up your copy to explore chic cottages, a royal chateau and learn how to import the timeless elegance of French décor into your own home, wherever it may be! 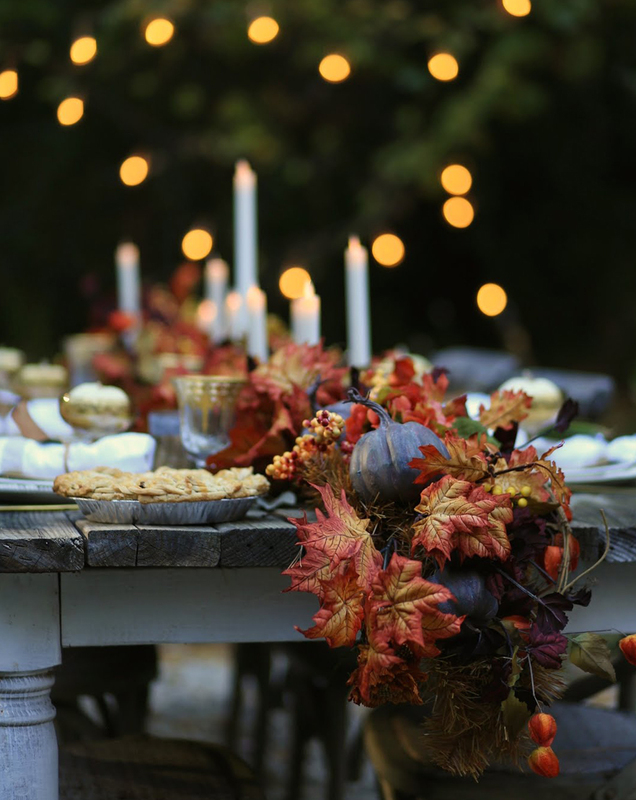 As we gather together today to honor traditions, make new memories and eat delicious food, we are reminded of how much we have to be grateful for. Thanksgiving could not be complete without the ritual of each person sharing their list of blessings in turn. When our opportunities to speak approach, we are by no means at a loss for words. We will start with gratitude for the support and encouragement of the wonderful people who surround us and fill each day with such beautiful inspiration. Next, we will reference each exciting opportunity we’ve had to go somewhere we’ve never been and try something new that we’ve never done before. 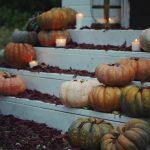 And how could we end before mentioning the joys and challenges that came with making a house feel like a home each season in 2017? This year, we’re especially thankful for YOU! Thank you for inspiring us with your impeccable taste, thank you for joining us as we continue to explore and discover and thank you for so graciously inviting us into your homes to share this experience together. Happy Thanksgiving! 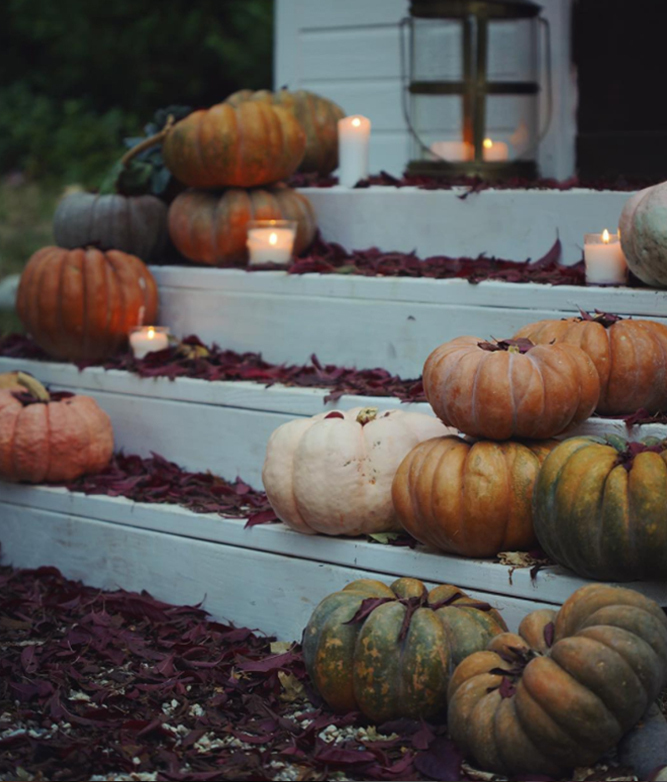 With so many unique varieties to choose from, we've picked the prettiest pumpkins for natural fall decorating. Courtney packs quite a bit of detail into a small space with this vignette. 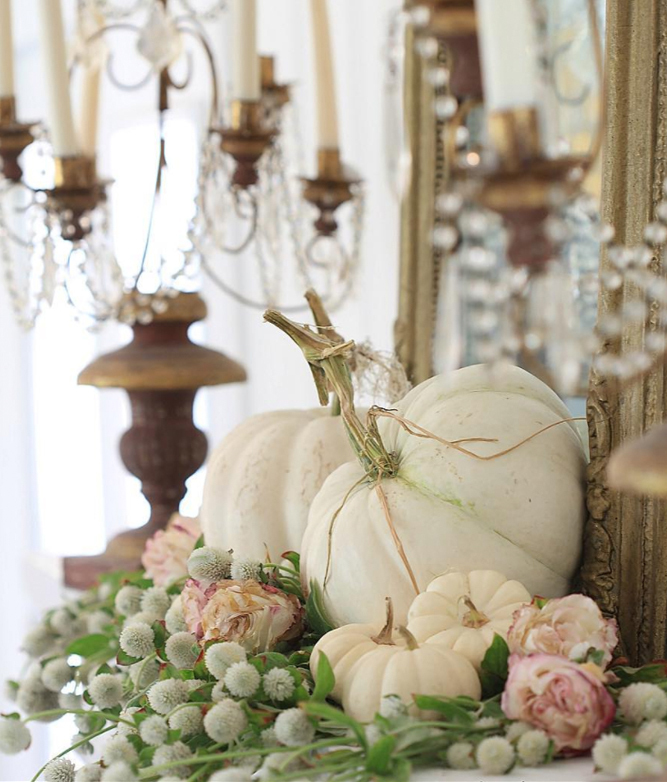 When too much color could easily overwhelm the area, she uses small white pumpkins that help show off the surrounding shades of gold and pale pink. Casper, Cotton Candy, Lumina and Baby Boo are options that make for the perfect autumn touch when only white will do. For a look that blends earthy and ethereal with storybook-worthy results, opt for old-fashioned varieties of French extraction. 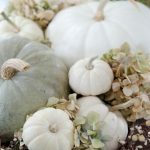 Pastel Cinderella (also known as Rouge Vif d’Etampes) and Fairytale Pumpkins (or Musquee de Provence) have distinctive shapes with well-defined ribbing that are reminiscent of the enchanted coach’s humble beginnings. A bonus? These two varieties are also deliciously flavored! Courtney uses candles and a blue Jarrahdale to add to the whimsical scene. 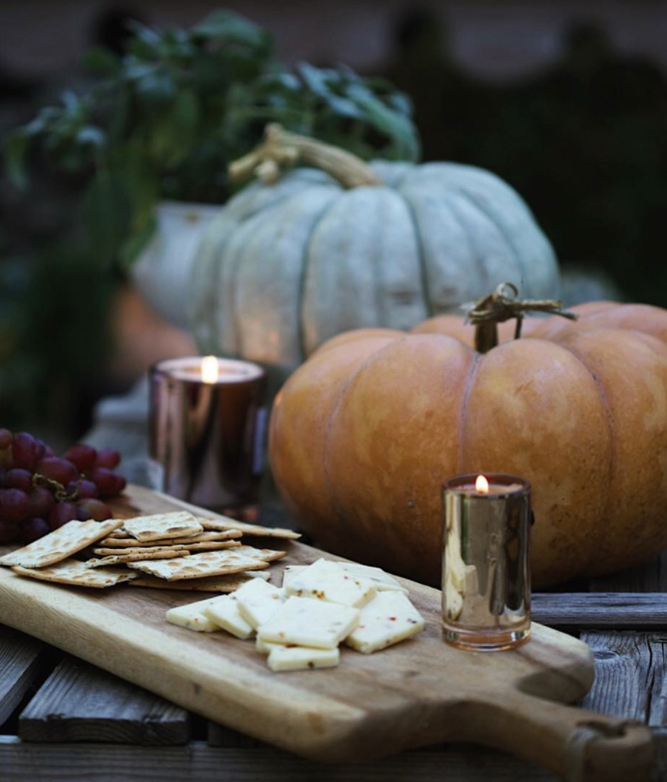 Few things symbolize the spirit of autumn quite like a traditional, orange pumpkin. 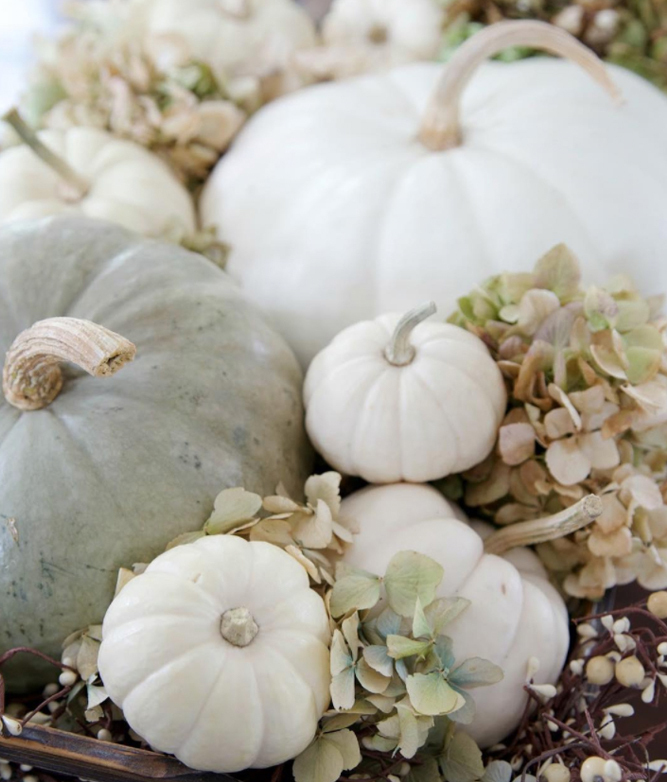 Howden and Connecticut Field are among the varieties you’ll expect to find at your local pumpkin patch. 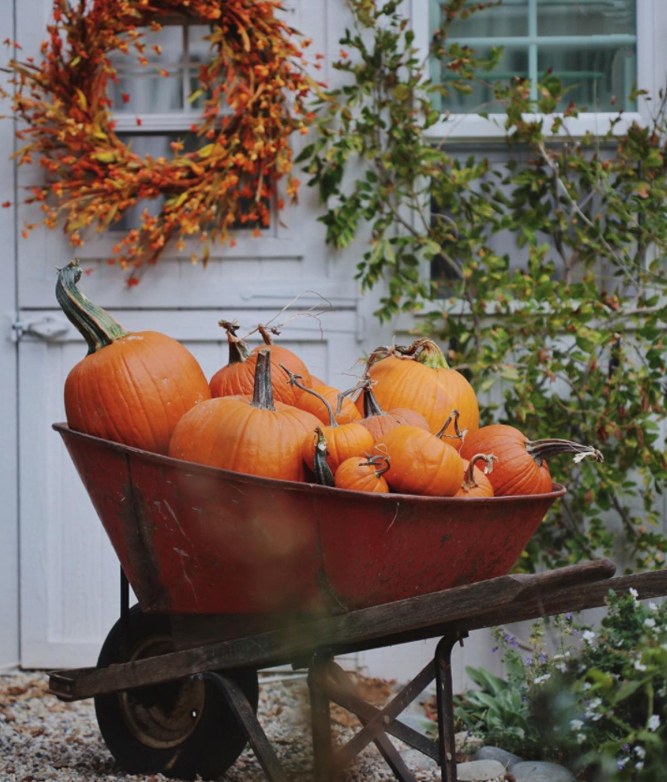 Courtney carted her haul in a wheelbarrow that makes a festive outdoor display. 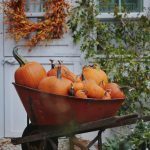 Whether you choose to carve Jack-O-Lanterns for Halloween or keep them intact till after Thanksgiving, the ubiquitous orange pumpkin is guaranteed to make you feel like fall is in the air. 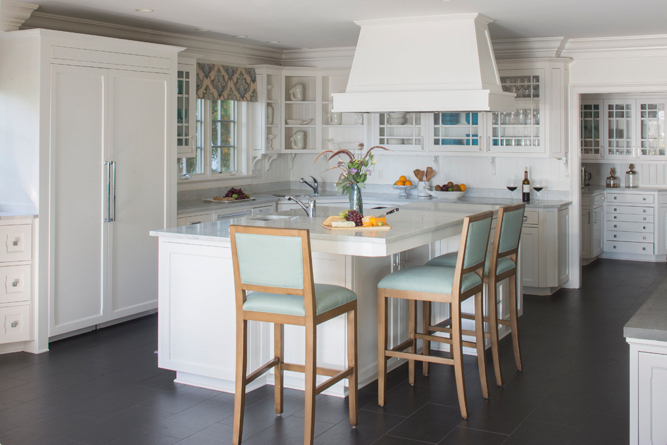 Situated on the Connecticut coast, this 1904 colonial cottage combines timeless elegance with ocean-inspired colors. A large, mullioned window—complete with window seat—brings in plenty of natural sunlight to illuminate the living room. 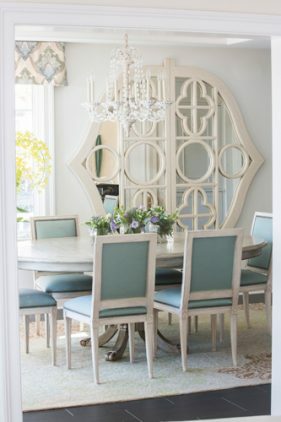 The space is elegant in the white and pale-blue color palette, French- inspired furnishings and gold accents. The draperies are a bespoke design, specifically patterned to include each shade highlighted in the room’s color scheme. Dotted along the New England coastline are cities and towns that play host to the numerous New Yorkers who escape the cramped hustle and bustle of urban life and retreat to quieter settings for their vacations and holidays. Ezra and Marlene Field are two such city dwellers, who found a place to call home away from home in the town of Southport, Connecticut. During the summers, the couple and their three girls enjoy spending time at a century-old Colonial cottage located right on the beach. The family turned to interior designer Tina Anastasia and her team at Mark P. Finlay Interiors to make their vision for a luxurious and traditional home become a reality. White walls and cabinets keep the Christopher Peacock-designed kitchen looking fresh, open and clean. Tina and her team updated the range and refrigerator to larger options suitable for entertaining and refinished the multihued wood floors in a uniform color. The blue upholstered counter chairs are a comfortable place to pause for a snack. Mirrored French doors hang as art in the dining room, where they make a stunning focal point without overwhelming the space. Unobstructed views of the harbor are the highlight of several rooms, so Tina drew inspiration from the seascape to decorate the home’s interior. The same shades of aqua, blue and white found in the ocean’s waves are also found inside the home. The muted tones maximize the sun’s brightness as it enters each room through mullioned windows, making the gold accessories glitter. 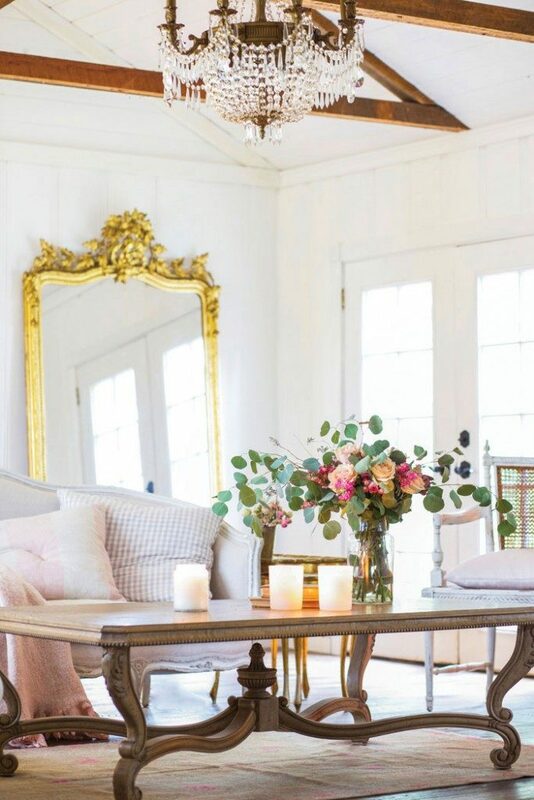 Metallics, particularly gold, can elevate any space when used properly. Careful to keep the decor from becoming gaudy, Tina uses gold just often enough that it acts as a neutral tone, but not so repeatedly that it overwhelms. In the living room, the designer’s foundation is the classic combination of white and blue; the addition of gold accents results in a look that is luxurious yet approachable. 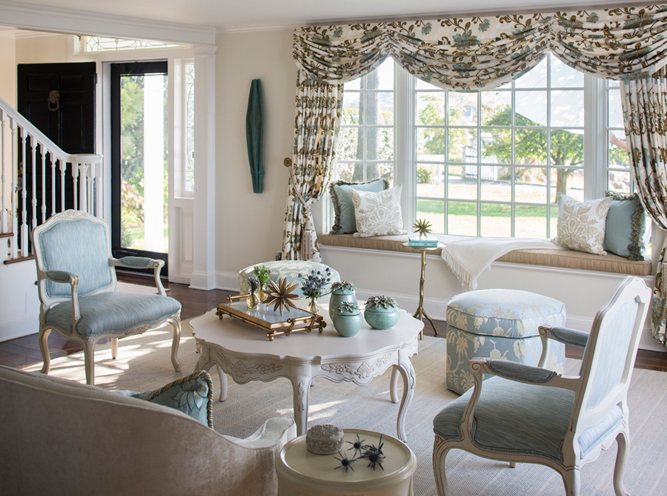 Curated furnishings in gracefully traditional shapes complement the airy elegance of the color palette. Bulky furniture in dark finishes would have been a burden on the vision they were working to achieve. “The views of the water are amazing, so we focused on choosing pieces that were not too heavy,” the designer says. Dark tones are at a minimum, which means where they do occur, they are even more impactful. The breakfast room benefits from the energy created by the contrast of the turquoise velvet upholstery against espresso-stained wood and the white walls. Comfort is key in vacation homes, and pale shades help ensure a calm atmosphere. Tina incorporated pieces with ornate French influence, balanced by those styled in transitional simplicity for a sophisticated blend. In the family room, plush upholstery rounds out the mix, with an ottoman-style coffee table featuring tufting for refined texture. In addition to the plush upholstery, Tina strategically uses textiles to bring color and pattern into each room with old-fashioned refinement and fresh appeal. She pays special attention to the draperies, using the rich fabrics to frame the picturesque views and tie each room together. In the living room, the designer could not find the ideal fabric that incorporated touches of gold as well as the right shades of blue. The solution was to design a custom pattern that would exactly match her specifications for the formal space. Tassels and tie-backs complete the look. 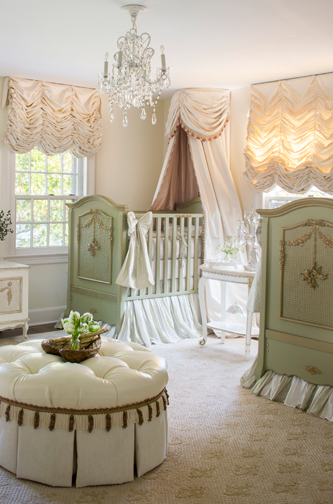 Green, pink and gold combine in the twins’ nursery for a gentle and feminine feel. 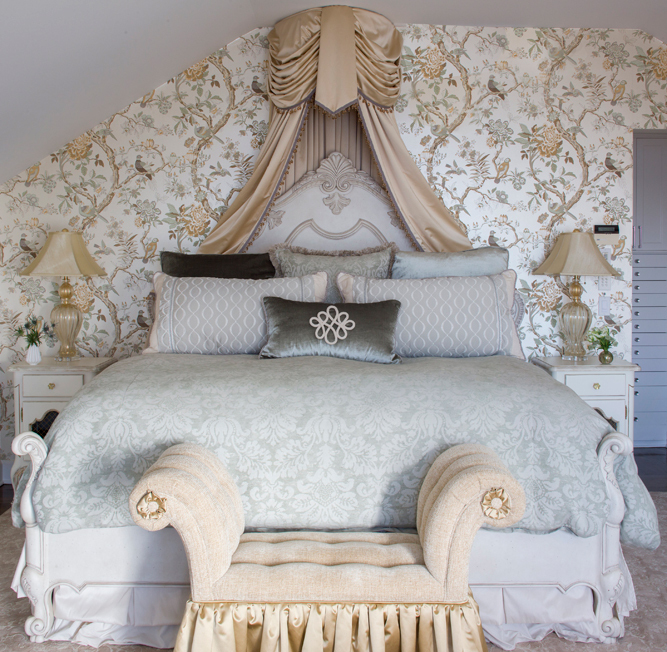 Rich fabrics are not limited to the window treatments in this house, as Tina also uses elaborate canopies to crown the beds in the master bedroom and the children’s rooms. “Canopies over the beds add softness,” she says. Over the carved headboard of the master bed, intricate folds in the palest gold complement the gold shade found in the wallpaper. Likewise, the twin girls have white-and-pink canopies over their sage-green cribs that add to the old-fashioned femininity of the room. Luxury requires impeccable attention to detail. In this Connecticut getaway, Tina has honored tradition, while infusing the space with concepts that are as fresh as a sea breeze. 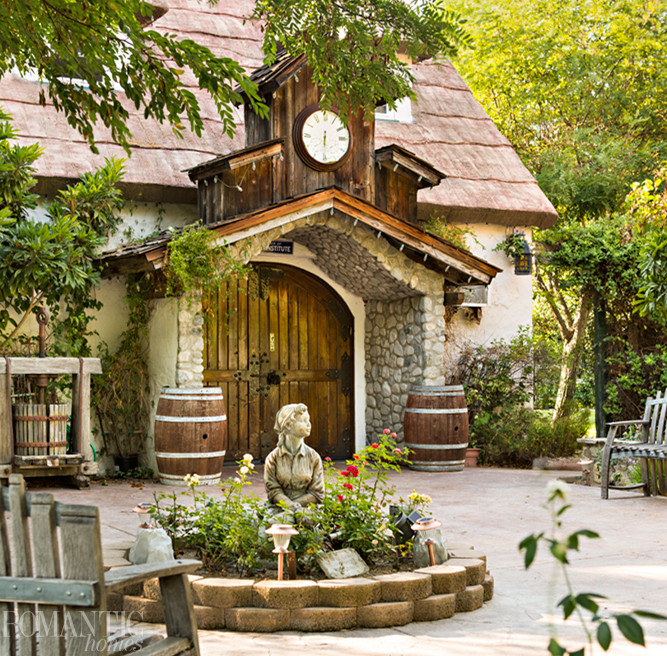 Briar Rose Winery offers a magical experience. Surrounded by lush landscaping, the front garden is a favorite place to relax with a glass of red or white. Row after row of orderly grapevines contour the rolling hills of the secluded Temecula Valley Wine Country. Nestled on a hill and guarded by high hedges rests Briar Rose Winery. It is unique among the other nearby notable wineries, as it owes its architectural heritage to the creative vision of one of Disneyland’s original Imagineers. Inspired by his wife’s fondness for the Snow White fairytale, Fantasyland architect Beldon Fields constructed the cottage and its surrounding structures five decades ago as a gift to her—a country retreat away from the hustle of city life. With the estate’s deceptively ingenious cement “thatch” roofing and lush landscaping, entering the front garden through the high hedges is like stepping into the illustrated pages of a story by the Brothers Grimm. When Les and Dorian Linkogle purchased the property in the 1980s, the couple promised Fields that they would preserve the cottage’s charm for years to come. 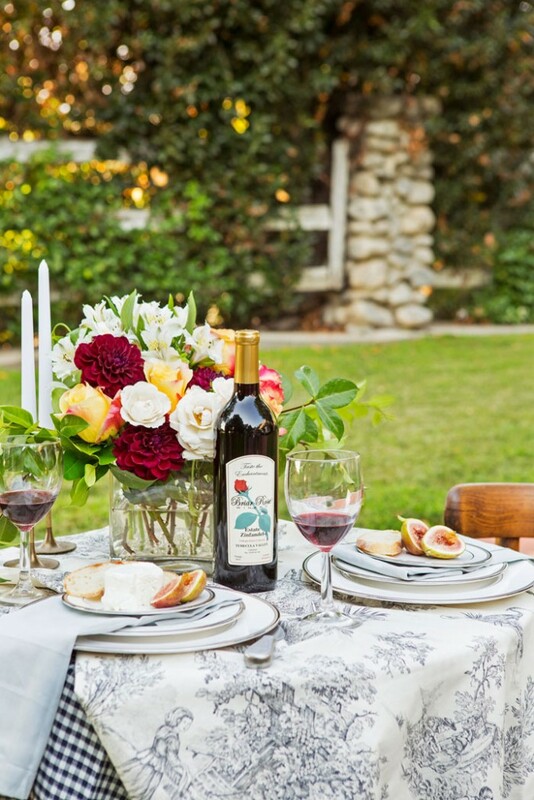 Since then, Briar Rose has evolved from a family home into a boutique winery that welcomes local wine lovers—among whom the winery has achieved a cult status following—and international guests alike to savor award-winning wines and the charming atmosphere. Entering the wine business was almost an afterthought for the Linkogles. They planted grapes to offset the cost of watering their son’s dirt motocross track and sold the produce to the nearby wineries until a friend convinced them it would be more rewarding and “easy” enough for them to produce their own wine. “It absolutely was not easy!” Dorian laughs. But she and Les have loved every minute of it, from the research process in the beginning to finally uncorking a fresh bottle for their visitors. “So much effort and enjoyment goes into the making of fine wine,” Dorian explains. “It’s art in a bottle. When your name is on the label, it can’t be anything but the very best.” The owners’ dedication to an excellent product and intimate hospitality carries over to the winery’s staff, who are ready and willing to discuss each award winning wine with those who come by for a tasting. 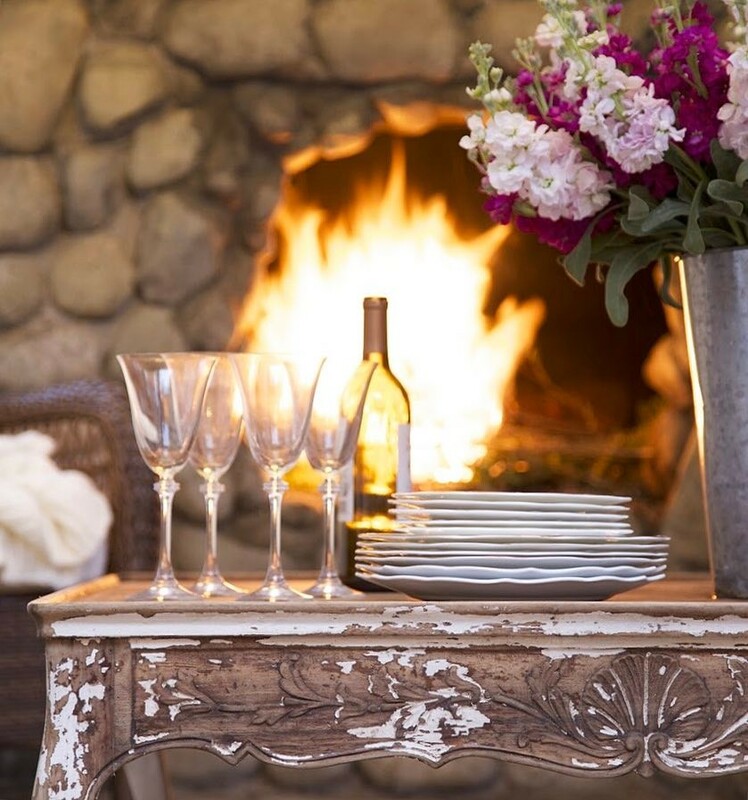 Guests have the option of enjoying their beverages in the cottage’s tasting room or taking their glasses outside to the weathered wood benches which are shaded by an ancient olive tree. Just as lovely as the garden are the views which overlook the vineyards. Dotting the landscape, vintage farming and winemaking equipment add to the nostalgic and evocative feeling in the serene setting. “When we were thinking of what we should call this place, we knew it had to keep the fairytale element,” Dorian explains. “It’s such a sleepy little beauty hidden away up here that Les suggested we name our winery Briar Rose—after the princess—and I just love the way it fits.” At Briar Rose Winery, Dorian and Les are living the dream they worked so hard to achieve and are eager to share it with their guests.